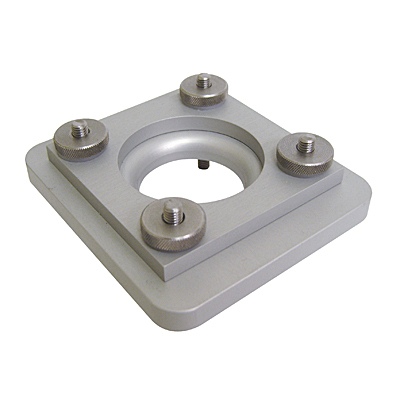 The TMS extensibility fixture consists of a pair of aluminium plates to clamp the sample across an aperture at the center of each plate. 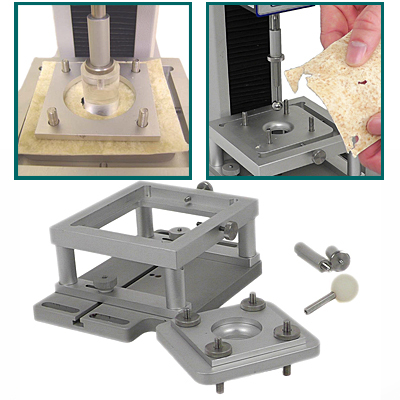 The lower plate has a smoothly radiused edge to the hole to avoid tearing the test sample. The aperture allows a probe to pass through, placing the sample under tension and deforming it potentially until rupture. Select a probe design to meet the specific requirements of the analysis. The fixture is ideally suited to testing thin products such as flatbreads and tortillas, to evaluate tear resistance, burst strength and the effects of staling. Large and small aluminium lower plate with radiused hole with corresponding top plate for gripping sample. Purchase probes to burst through sample separately. Select and purchase probe separately.